The Heartland Alliance, an international non-government organization based in the US, surveyed a sample of 5990 mothers of girls aged 4 to 14 from the four governorates of the Kurdish region of Iraq Erbil, Dohuk, Suleymania and Halabja. The decline in FGM rates was found across all regions and in all education and income groups. Most noticeable are the declines in Erbil, Suleymania and Halabja, where FGM rates were previously much higher than in the province of Dohuk. While 60,3% of mothers reported to be cut in Suleymania, they reported this about their daughter only in 11,8% of the cases. In Halabja, the practice seems to be almost eradicated. While 40% of mothers said they had undergone the procedure, only 1,1% of their daughters had done so. In Dohuk, FGM rates have been traditionally low, the majority Kurmanji population does not practice FGM: Only 7,4% of mothers here said to be cut. The decline in the daughter’s generation was comparably small with 4,1 mothers reporting their daughters to be cut. Because of low prevalence in the first place, Dohuk has not been target of major campaigning efforts in the past. Thus, it does not surprise that the little decline corresponds with lower awareness about health related problems. Only 19,5% of women in Dohuk had heard of health problems while in Suleymania 61,6% were aware of health risks. 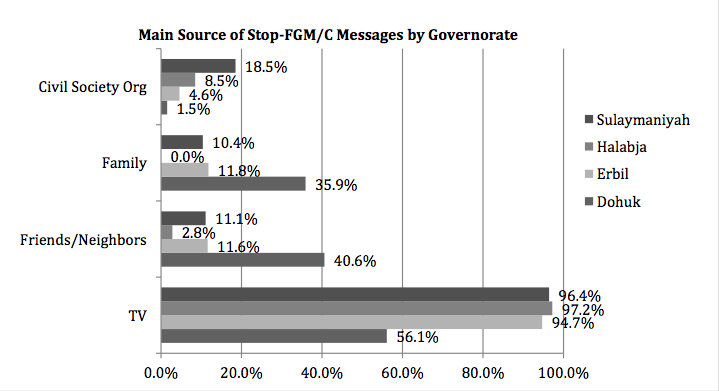 Only 34,4% of respondents in Dohuk had taken notice of Anti-FGM messages while in all other provinces 75% recalled seeing or hearing these messages. This may be surprising on first sight, as the main campaign against FGM in Northern Iraq by WADI used television clips which were played on most Kurdish TV-channels, thus also in Dohuk. TV campaigning as shown in the study was the most noticed by respondents: 88,4% of women who heard anti FGM messages recalled TV-clips, while less than 20% had heard such messages from civil society organizations. Yet, it is evident that TV-clips were recalled much more in those provinces where campaigning included many more features from direct visits to villages, schools and sports clubs to events in the city and trainings for policemen, lawyers and midwifes. When it comes to motivations for continuing the practice, religion (63,3%) was cited most often as a reason followed by tradition (61,7%). Interestingly, these two were also main reasons to discontinue: 40% of mothers whose daughters were not cut said it was not part of their tradition and 23,5% said religion forbade the practice. Important for this decision was also the desire not the harm the daughter (29%) and harmful health outcomes (25%). In the province of Dohuk, religion played a much more important role than in other provinces. Here 93,8% said, their daughters were cut because it was a religious requirement. It could be assumed that religion’s role becomes more important the less tradition and surrounding demand the practice. On the other hand, religious leaders did not seem to be important proponents of FGM for the younger generation in Iraqi Kurdistan. Only 4,4% of respondents said religious, tribal or community leaders had encouraged cutting their daughters. The most cited persons to encourage the practice were Mother in Law (41,7%) and Mother (31,1%). This can also be interpreted as a success of campaigning: During the campaign WADI teams visited Mullahs and discussed with them demanding them to respect the law prohibiting FGM and encouraging them to condemn the practice in their sermons. Evidently, campaigning efforts should be continued in the provinces of Erbil and Suleymania as some support for the practice still persists. Yet, even mor evident is the need to substantiate campaigning efforts in Dohuk where rates are very low, yet proponents are little disturbed in believing in benefits of FGM. The study also shows the importance of a holistic approach: religious and health issues must be addressed equally. Media messages only reach their audience were other campaigning tools are used at the same time. By hannahcaroline36 in News, Press Statement on 2017/01/10 .